News for product liability attorneys – Girl’s hooded jackets with drawstrings voluntarily recalled. Girl’s jackets, manufactured by Regaliti Inc., of New York, sold exclusively at Burlington Coat Factory are being recalled due to strangulation hazard. Washington DC (NewYorkInjuryNews.com) – The U.S. Consumer Product Safety Commission, (CPSC) http://cpsc.gov in cooperation with Regaliti Inc., of New York, NY, has announced a voluntary recall of a jacket sold under the brand name Betty Blue, as announced by the CPSC. The brand was manufactured in Hong Kong. The drawstring through the hood is suspected to be capable of causing a strangulation hazard to young children. In February of 1996 the CPSC issued guidelines, which were voluntarily incorporated into industry standards, to prevent children from becoming entangled or strangled by drawstrings in sweatshirts and jackets. 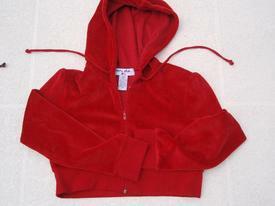 The recalled jackets are girl’s cropped jackets made of a velvet-like material with a drawstring hooded sweatshirt. They come in the colors pink, red, blue, and brown; sizes small through extra-large. Betty Blue Girls is printed on the tag. There are approximately 3600 units that were exclusively sold at Burlington Coat Factory nationwide from November 2007 through September 2009. Those that purchased the product are advised to either immediately remove the drawstrings from the jackets to eliminate the hazard or return the garment to Burlington Coat Factory or Regaliti for a full refund. Any questions should be directed to Regaliti at (212) 840-0202 between 10:00 a.m. and 3:00 p.m. Wednesday through Friday or Burlington Coat Factory’s website at www.burlingtoncoatfactory.com. Legal News Reporter – Tara Monks: Legal news for product liability attorneys.